Where does the news come from in today’s changing media? Who really reports the news that most people get about their communities? What role do new media, blogs and specialty news sites now play? How, in other words, does the modern news “ecosystem” of a large American city work? And if newspapers were to die—to the extent that we can infer from the current landscape—what would that imply for what citizens would know and not know about where they live? The questions are becoming increasingly urgent. As the economic model that has subsidized professional journalism collapses, the number of people gathering news in traditional television, print and radio organizations is shrinking markedly. What, if anything, is taking up that slack? The answers are a moving target; even trying to figure out how to answer them is a challenge. But a new study by the Pew Research Center’s Project for Excellence in Journalism, which takes a close look at the news ecosystem of one city suggests that while the news landscape has rapidly expanded, most of what the public learns is still overwhelmingly driven by traditional media—particularly newspapers. The study, which examined all the outlets that produced local news in Baltimore, Md., for one week, surveyed their output and then did a closer examination of six major narratives during the week, finds that much of the “news” people receive contains no original reporting. Fully eight out of ten stories studied simply repeated or repackaged previously published information. And of the stories that did contain new information nearly all, 95%, came from traditional media—most of them newspapers. These stories then tended to set the narrative agenda for most other media outlets. The local papers, however, are also offering less than they once did. For all of 2009, for instance, the Sun produced 32% fewer stories on any subject than it did in 1999, and 73% fewer stories than in 1991, when the company still published an evening and morning paper with competing newsrooms. And a comparison of one major story during the week studied—about state budget cuts—found newspapers in the area produced only one-third as many stories in 2009 as they did the last time the state made a similar round of budget cuts in 1991, and the Baltimore Sun one seventh as many. Yet the numbers suggest the addition of new media has not come close to making up the difference. Indeed the expanding universe of new media, including blogs, Twitter and local websites—at least in Baltimore—played only a limited role: mainly an alert system and a way to disseminate stories from other places. New technology was more prevalent as a way for media—both traditional and new—to break news more quickly. The Web is now clearly the first place of publication. And this faster dissemination of news was tied to three other trends. As news is posted faster, often with little enterprise reporting added, the official version of events is becoming more important. We found official press releases often appear word for word in first accounts of events, though often not noted as such. In the growing echo chamber online, formal procedures for citing and crediting can get lost. We found numerous examples of websites carrying sections of other people’s work without attribution and often suggesting original reporting was added when none was. We found elements of this in several major stories we traced. And sometimes old stories that were already obsolete were posted or linked to after events had changed and the original news site had updated them. These are some of the results of a close examination of the media covering Baltimore, MD, during the week of July 19-25, 2009. The network of news media in Baltimore has already expanded remarkably. We identified 53 different news outlets that regularly produce some kind of local news content, a universe that ranges from blogs to talk radio to news sites created by former journalists. These are multi-platform operations that also make robust use of Twitter as a way means of dissemination. Twelve of those outlets did not produce any local content during the days studied. Among the six major news threads studied in depth—which included stories about budgets, crime, a plan involving transit buses, and the sale of a local theater—fully 83% of stories were essentially repetitive, conveying no new information. Of the 17% that did contain new information, nearly all came from traditional media either in their legacy platforms or in new digital ones. General interest newspapers like the Baltimore Sun produced half of these stories—48%—and another print medium, specialty newspapers focused on business and law, produced another 13%. Local television stations and their websites accounted for about a third (28%) of the enterprise reporting on the major stories of the week; radio accounted for 7%, all from material posted on radio station websites. The remaining nine new media outlets accounted for just 4% of the enterprise reporting we encountered. Traditional media made wide use of new platforms. Newspapers, TV and radio produced nearly a third of their stories on new platforms (31%), though that number varied by sector. Almost half of the newspapers stories studied were online rather than in print. There were two cases of new media breaking information about stories. One came from the police Twitter feed in Baltimore, an example of a news maker breaking news directly to the public rather than through the press. Another was a story noticed by a local blog, that the mainstream press nearly missed entirely, involving a plan by the state to put listening devices on buses to deter crime. A newspaper reporter noticed the blog and then reported on the story, which led the state to rescind the plan. As the press scales back on original reporting and dissemination, reproducing other people’s work becomes a bigger part of the news media system. Government, at least in this study, initiates most of the news. In the detailed examination of six major storylines, 63% of the stories were initiated by government officials, led first of all by the police. Another 14% came from the press. Interest group figures made up most of the rest. The study examined the news produced by every local news operation we could identify in the city—from radio talk shows, to blogs, specialized new outlets, new media sites, TV stations, radio news programs, newspapers and their various legacy media websites. We identified 53 outlets that regularly produce some kind of local news content. We tracked every piece of content these outlets produced for three days during the target week. Then PEJ did a deeper, secondary analysis of six major story threads during the target week, charting the course of the story, where it started and how it grew, story to story, minute-by-minute. The six narratives were selected from among the biggest of the week to reflect a range of different kinds of stories, from breaking news about crime, to state government budget cuts to stories that clearly involved the use of new media. PEJ identified which stories contained new information or added new angles and which sources and people drove the narrative. And Twitter feeds about the news were tracked as well, to see who was using that technology to communicate. That analysis identified 10 additional outlets that passed information along and 15 outlets that offered Twitter updates on the major storylines of the week. Those six major storylines are provided as detailed chapter narratives of their own in this study, allowing a reader to examine exactly how each story broke, the flow of each narrative through the course of the week, and the lessons it revealed about the news system in the city. This study is only one attempt at trying to understand who is producing news and the character of what is produced. Additional reports could tell more. But this snapshot was in many ways a typical week—marked by stories about police shootings, state budget cuts, swine flu, a big international soccer game in town and a mix of fires, accidents, traffic and weather. The array of local outlets within this snapshot is already substantial, and as times goes on, new media, specialized outlets and local bloggers are almost certain to grow in number and expand their capacity, particularly if the Sun and other legacy media continue to shrink. New outlets such as local news aggregators, who combine this increasingly mixed universe into one online destination, have cropped up in some other cities such as San Diego. There is a good deal of innovation going on around the country, much of it exciting and promising. But as of 2009, this is what the news looks like in one American city. Of the more than four dozen outlets identified as producing original content about local events in Baltimore, there are four local TV stations, all with their own websites. There are five general interest newspapers: the Baltimore Sun, City Paper, Towson Times, the Washington Post and the Baltimore Times, which focused on African American culture, as well as two long-standing specialized papers—the Daily Record and the Baltimore Business Journal. There are also four general interest websites in town, from the Investigativevoice.com, a local watchdog reporting website started by former Baltimore Examiner employees, to BaltimoreBrew.com, a local news website produced mostly by former Baltimore Sun staffers. There are five local blogs, two of which focus on crime, one called Inside Charm City, a hyperlocal general interest blog produced by a single person. And there are more than 30 that exist inside the universe of the Baltimore Sun newspaper website. Among more than three dozen radio stations operating in the Baltimore area, just a handful broadcast local news or talk. Those were identified on two commercial stations, WBAL and WCBM, and two public radio stations, WEAA and WYPR. That first level analysis found that, over those three days, these media produced 715 different stories about local events in the city. Those stories came from 41 different outlets. Twelve outlets produced nothing. Local TV newsrooms produced more content than any other sector, an average of 73 stories per station (a total of 291 stories either in broadcast or on their websites out of the three day sample of 715). That was followed closely by newspapers. The five papers studied produced 186 stories during these three days, or 37 per outlet. Yet the quantity of stories produced does not tell everything about their nature. Some media were more locally focused than others. The media sector that devoted the greatest level of its coverage to local events was TV news. Fully 64% of the stories on the local 6 p.m. TV newscasts were about local matters. By comparison, 53% of stories studied in Baltimore area newspapers were local. 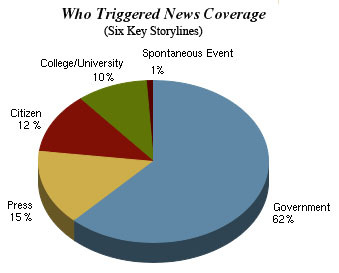 In talk radio, the majority of the segments were about national or non-local events (52%). The new media content in new media, on the other hand, was highly local and mostly locally produced, though, as we will see, it was often brief and derivative of other news accounts. More than eight out of ten of the postings or stories (85%) were locally focused. The level of original work also varied. 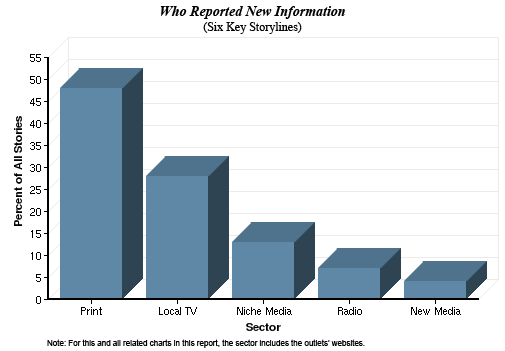 Eight out of ten newspaper stories (80%) were straight news accounts written by local staffers. In television, there was also less original content from staff reporters. Roughly a third the stories, 34%, were edited packages featuring correspondents doing the reporting (the TV equivalent of an original staff written story), and another 13% were anchors narrating a taped package that did not feature a correspondent from the field. 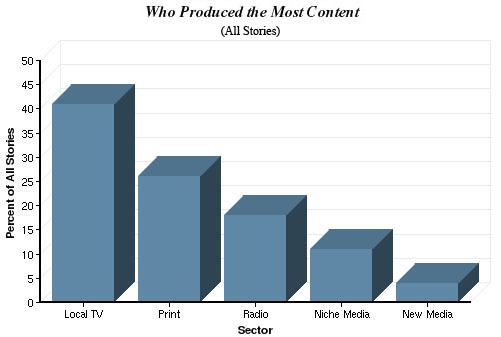 But more than a third 36% were “anchor reads” and “tell stories,” often material from wire services. In radio there was little of what would be considered reporting. Roughly half the segments were anchors doing monologues, and 38% of the segments involved the host interviewing a guest or a caller. There was no original reporting found, either in talk radio or in the news inserts and radio headlines that were produced during the periods studied (during the 7 a.m. drive time hour). Looking at the topics covered, too, the news agendas of these outlets were strikingly different. The world one encounters differs dramatically depending on where one seeks his or her information. On local television, for instance, fully 23% of stories studied were about crime, twice as many as other subject. In newspapers (online and print) coverage of crime was almost matched by that of government and closely followed by business and education. On radio in Baltimore, by contrast, government was the No. 1 topic. New media was most often focused on government. To go deeper, however, to see how the ecosystem moved, how information traveled from one sector to another, who initiated the news and who was first to transmit and frame the narratives that the rest of the media followed, the study also took a look at six of the major stories of the week more closely. 1. The proposal by Governor Martin O’Malley to cut $300 million from the state budget, or about 40% of the total cuts he sought to make from the state’s $14 billion budget. 69 stories appeared across all the outlets studied during the week, only six of which came from new niche media. The Sun produced six in print (and six more online), but that was a fraction of the 49 it produced during a comparable week in covering the 1991 budget cuts. Fully 71% of all the stories were triggered by the governor’s statements. Just 7% were the result of press enterprise. 2. A shooting incident in which a 34-year-old Baltimore man, apparently high on the drug Ecstasy, terrorized two former female companions and then shot two city police while being wounded and apprehended himself. Despite at least five separate crime-oriented blogs in Baltimore, nearly all of the information on this story came from the Sun or local television. Aside from brief mentions on two of the blogs, the niche-crime outlets were silent. The mainstream press and the police department used Twitter extensively to update information. 3. The announcement that the University of Maryland, Baltimore had been selected as one of eight sites nationwide that would test the new H1N1 vaccine for the National Institutes of Health. Media enterprise was all but absent in covering this development tied to a larger national and world event. Nearly all of the reporting came from the initial university news release and the press conference held on campus. 4. The auction of the historic Senator Theater, an old movie house in north Baltimore that continued to fight for survival while defaulting on its loans. The press largely missed the story. Of the 15 identified stories that ran before the auction, only three raised the possibility of what ended up happening. 5. A plan by the Maryland Transit Administration to put listening devices on buses died a sudden and conclusive death once the press discovered it. The death in this case revealed the power and influence that the mainstream press still holds. The story was first reported by an online niche website but went unnoticed for days until a Baltimore Sun reporter picked it up. Then, within hours, MTA killed the plan. Then in the echo chamber of the Web, the broadest distribution of MTA’s plans came after the agency had already killed it. Ten of the 14 local stories (and another 12 reports outside of Baltimore) “revealed” the plan as a possibility being considered after it was already dead. 6. A series of different events intertwined and formed the biggest narrative of the week—framed by an investigation by the local newspaper—involving how the state and the city approached juvenile justice and incarceration. There were 78 published pieces on juvenile justice during the week. Of those, 68 came from traditional media outlets. And two news outlets – the Baltimore Sun and NBC Affiliate WBAL-TV—did almost all of the reporting. Others mostly picked up and reproduced their work. 1. According to Factiva, the Sun produced 23,668 2 stories on all topics from January 1 through December 31, 2009 and 34,852 in the same time frame in 1999 and 86,667 in 1991. 2.Three days of content was analyzed for the study. This included content from July 20, 22 and 24, 2009. 3. Early evening local TV newscasts were recorded and analyzed. For WMAR, WJZ and WBAL, we examined the 6 p.m. newscast. WBFF, the Fox affiliate, does not air news at 6 p.m., so we examined its 5:30 p.m. newscast. 4. A third commercial station, WJZ, could not be captured by PEJ. 6. Add accidents (another 13%), and more than a third of all the coverage related to public safety—numbers that track closely with research on local TV that PEJ has produced over the years. And if one looked at the stories that led the newscasts, crime and accidents made up roughly six out of ten stories (58%). That number, incidentally, is also identical to that we found in a five-year study of more than 33,000 stories in local TV news examining 150 stations around the country. “We Interrupt This Newscast: How to Improve Local News and Win Ratings, Too.” Columbia University Press, 2007, p. 33.